Keuka Studios offers five standard railing styles: our Ithaca Style, Keuka Style, Chicago Style, Tokyo Style, and Prairie Style. In addition to these styles, our skilled designers and craftsmen can create modified versions of these designs. We also offer completely customized railings. Between the shape, material, and finish of the railing posts, top rail, infill, and mount, Keuka Studios offers endless options for custom railings. If you have a specific idea of how you want your railing to look or if the unique layout of your home requires customization, contact us to discuss your vision. For inspiration, take a look at a few custom railings Keuka Studios has fabricated for clients. Designed by architect Vibeke Lichten, the “Eco House” on Shelter Island is a unique work of art. Keuka Studios had the privilege of providing a custom patio enclosure and cantilevered staircase for the project. For the patio, we designed custom steel railing posts that match the modern industrial aesthetic of the home. The owners of this Nantucket beach house wanted to unify their home with a modern nautical design theme. In order to incorporate this motif into the stairwell, Keuka Studios designed a custom glass railing system. The brushed stainless steel railing posts and the pipe top rail add a modern touch to the home’s white shiplap staircase. This pool deck has a pristine view of the turquoise water that surrounds this island in the Turks and Caicos. To optimize the view, our clients requested a cable railing without a top rail. Since this style of railing is allowed under the Turks and Caicos building code, we were able to craft their dream railing. We customized the railing and attachments to withstand the cable tension without a top rail. Our Prairie Style cable railings typically feature a herringbone design in the railing posts. While our client in Pine Top, Arizona loved the design, they needed a railing that would perfectly match the motif of their home. In order to acheive the specific look that the homeowners desired, our team made custom railing posts. Instead of the standard herringbone pattern, we crafted a pine tree design into the center of each post. 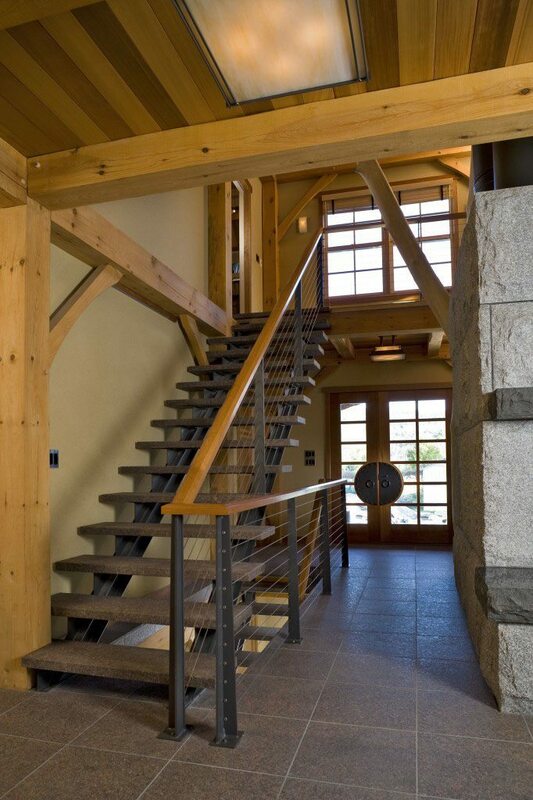 The architects of this timber frame home in Vermont knew exactly what they wanted for the main staircase and railing system. For the project, our team crafted a custom floating staircase with a unique cable railing system. The architects requested triangular railing posts that taper toward the top. Furthermore, they wanted the railing to have a hefty appearance to match the exposed beams and stone architecture found throughout the house. To acheive this look, we used “Dazzling Pewter” powder-coated steel for the custom railing posts and wood for the top rail.